I've had many questions as to what I've been up to for the past few weeks and why I haven't written any new blog posts lately. Well, the simple answer is that I took on a "little" side project. Ever since I turned the garage into a full blown woodshop, there's always been these pesky yard tools and equipment that were taking up valuable shop space. Anyone, who knows anything about woodworking, knows that yard equipment just has no business being stored in the sanctuary that is my woodshop. So really, I had no choice but to correct this issue as soon as possible, by building a storage shed in the back yard to create a dedicated area to store the offending yard care equipment. 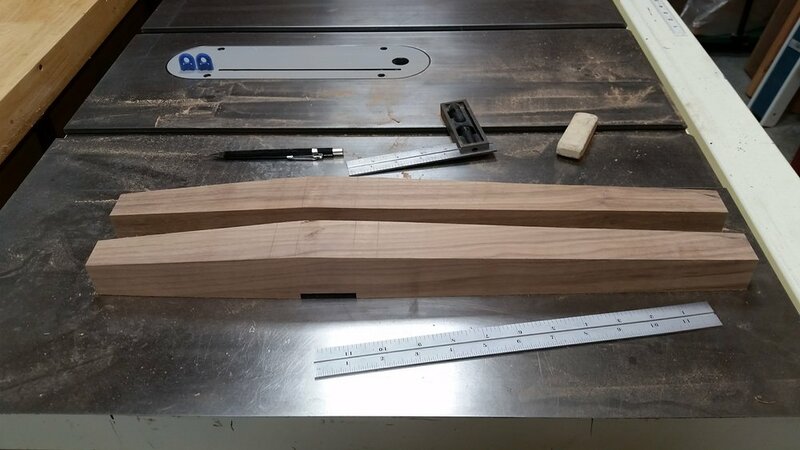 All jokes aside, it was actually really nice to step away from the exactness of the rocking chair build, to focus on a different project that didn't require the same level of precision. Here are a few pictures of the shed build process. I've had some salvaged pavers stacked behind the house for about a year, so this was the perfect opportunity to put them to use. Any good shed needs a solid pad foundation. Frame some walls and install some siding. Add a roof, hang the door, install the siding & trim, and slap on some shingles and BOOM, instant shed! It ended up being a lot of work, but I'm glad that I took the time to make it happen. I'm really happy with how it turned out and even happier with the extra shop space that was created by the mass exodus of yard equipment from the shop. After a couple coats of paint on the new shed, it was time to get back to the rocking chair build. The two pieces of stock that I'm using for the front legs had some checks and voids in the ends that needed to be stabilized with epoxy before I could cut the tapers in them. I also needed to fill a knot hole on the underside of the seat slab and a void in one of the runner edges, so I mixed up a batch of black epoxy one night after work and went work, filling the holes and voids. Before view of the end checks in the front legs. Front legs, seat slab, and runner with epoxy poured into the holes and voids. Front legs with voids filled with epoxy. Here's the void in the corner of the runner, filled with epoxy. After a little TLC with the sander, it's going to look awesome. A little chisel work to clean up the epoxy overflow around the knot hole on the bottom of the seat slab. 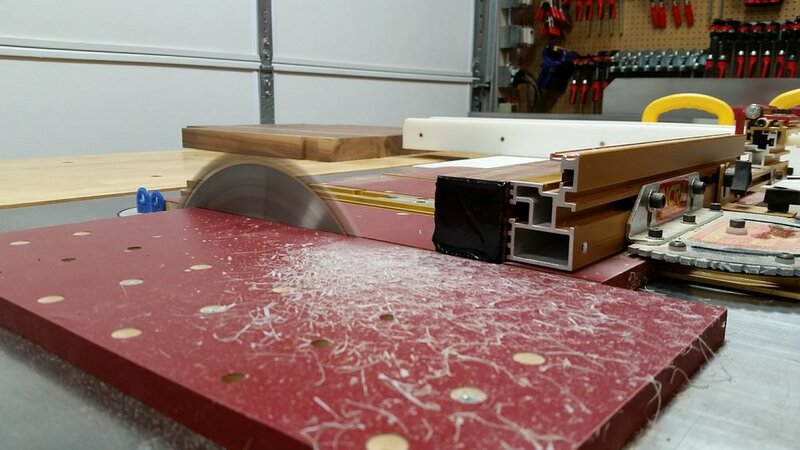 A quick trim of the excess epoxy on the cross-cut sled and the rear legs were ready for the next step. Ends of front legs after trimming off the excess epoxy. Before I could mark out the tapers on the rear legs, I needed to cut them to their final length. Since the rear legs are curved, the easiest was to cut them to length was with a handsaw. After some simple layout lines, I cut tapers into the edges of the front and rear legs using the bandsaw. The front legs needs a second set of tapers cut into the opposite face. The tapered legs are subtle, but it really changes the look of the legs and makes them look not so bulky. 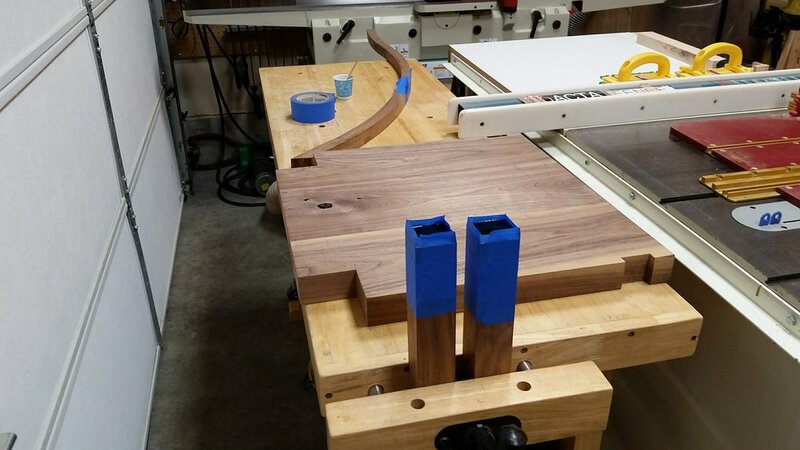 After cleaning the rough bandsaw marks on each of the tapers with the spindle sander, I just couldn't resist the urge to dry clamp the legs to the seat slab. Now that the legs were cut to final lengths, I could also do a test fit of the runners. I was feeling daring, so I even took the dry clamped chair down off the bench and gave it a "test sit" to make sure that it was solid before calling Katie out to the shop to check it out. I'd be lying if I said that there wasn't a little twinge of doubt in the back of my mind as I put all of my weight onto the chair, but thankfully the chair had no problem supporting my weight and the curve of the runners gave it a nice gentle rocking motion. I called Katie out to the shop and she sat in the chair for the first time. There's no arms, headrest, or back splats installed yet, so she couldn't get the full effect of how the chair will feel, but it was still exciting to see her sitting on a chair that I had created from nothing but a pile of raw wood. I've got 6 weeks left until our due date and I'm feeling as motivated as ever to get the chair finished up before then.